1) Preheat the oven to 325°F. Oil a 9-inch square baking dish with butter. 2) In the bowl of an electric mixer fitted with the whip attachment, whip the egg whites and sugar on medium speed until well incorporated and the sugar is nearly dissolved. Add the vanilla and almond extracts and salt; mix to combine. 3) Stir in the coconut by hand, then pour the mixture into the prepared baking dish. Press into an even layer. 4) Sprinkle the almonds over the coconut and press gently to secure. 5) Bake until the coconut begins to turn golden brown at the edges and the almonds are toasted, 20 to 25 minutes. Cool to room temperature. 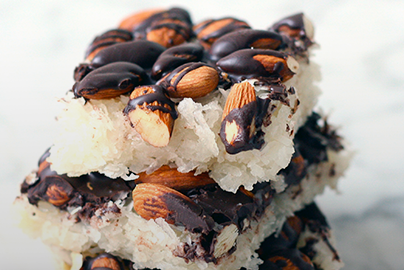 6) When the coconut mixture is cool, drizzle the melted chocolate all over the surface. Transfer the pan to the refrigerator and chill until the chocolate is set. 7) Slice into 12 even squares. Store in an airtight container until ready to serve, up to three days.